Sew what's cooking with Joan! : OMGOSH! Blue cheese and rosemary Scallop Potatoes! OMGOSH! 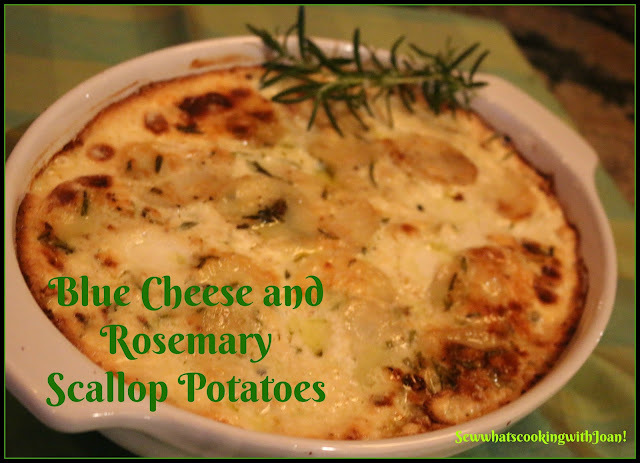 Blue cheese and rosemary Scallop Potatoes! Ready for a change in your everyday scallop potatoes? This is the perfect side for a steak, prime rib or Meatloaf Provence. 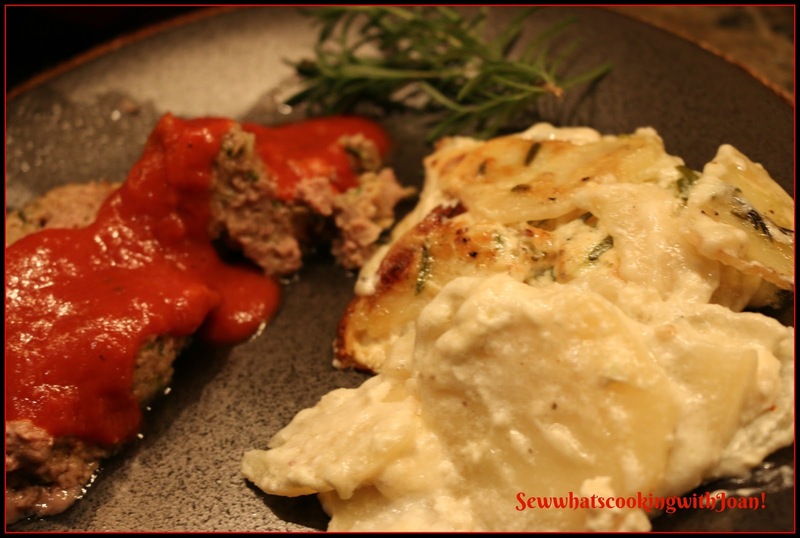 I made this the other night with my meatloaf Provence and had Wee Bear moaning for more! He is admittedly a Blue cheese-a-holic! The blending of grated Parmesan and Blue Cheese gives this dish such depth and creaminess....you will be going back for seconds! Preheat oven to 350 F. Butter a 9X13 glass baking dish or a oval baking dish. Toss in bowl with salt, pepper and rosemary. In small bowl, toss together cheeses. Layer half potatoes in dish, sprinkle with cheeses and top with remaining potatoes. In a bowl, whisk together sauce ingredients, pour over potatoes. Bake potatoes for about 1 hour and 15 minutes, or until browned and completely tender all the way through when poked with knife. * I have a lot of e-mails, for make ahead dishes. This can be made in advance and refrigerated up to two days. Bring to room temperature and reheat in 350 F oven until hot. This little Mommy decided my flower pot would be a great place to have a baby. She picked the afternoon, shady side of the pot. Just love it!! Makes me feel like a Midwife!! We have guests in this week for the Mountain Magic tournament. The tournament is for ladies, and is a three day, ambitiously competitive tournament. My partner, flew up, with her husband, from Cabo San Lucas on Tuesday and will stay with us until Sunday! Some pictures from the Welcome Party, Desert Mountain Ladies Member-Guest~ Mountain Magic! And yes, matching tatoo's! For luck!! And here is why we chose the dueling guns! 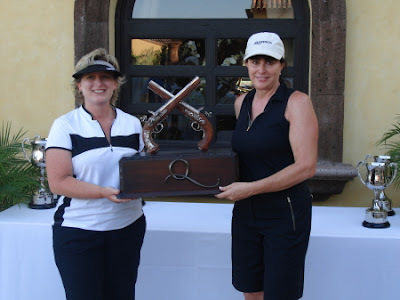 Wendy and I won overall 1st place at the member/member at Querencia in Cabo a few years ago! Great potato recipe! Also, I love your salt and pepper shakers. Are those new? The photos of the Mama Dove and her egg are so sweet! How cool! Hope the last day of your tournament went well today. Hi Laura! The salt and pepper shakers are not new, they have been with us or in storage(while in Mexico) for 12 years. http://www.wmboundsltd.com/shopdisplayproducts.asp?id=7 William signed and made it in Oct. 1999. He still makes some pep art grinders. Our little bird is still sitting, we check on her every morning! Our tournament results :-) I will post pic's on FB!! thanks for the comments!